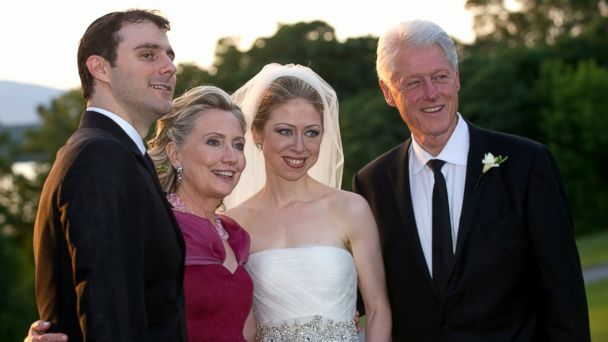 Charlotte Clinton Mezvinsky has been dubbed "the Clinton baby," but Chelsea's new bundle of joy is also part of the Mezvinsky family - and Bill and Hillary Clinton aren't her only interesting grandparents. Chelsea's husband, Marc Mezvinsky, is heir to a once-powerful political dynasty. His father, Ed Mezvinsky, was a two-term Democratic congressman, representing Iowa's first congressional district from 1973 to 1977. But in 2002, the former congressman pleaded guilty to swindling more than $10 million from family and friends in a Ponzi-esque scheme. Ed Mezvinsky himself also fell prey to a number of get-rich-quick schemes, including a "black money" scam in which a Nigerian man allegedly sold him a chemical that was supposed to remove ink off of $100 bills. Authorities say scammers probably used plain black construction paper. His wife, Marjorie Margolies, who divorced Ed in 2007, also served a term in Congress. Her election to Pennsylvania's 13th district seat in 1992 came on the heels of a 25-year career in broadcast journalism, including a stint at NBC's "Today Show." On the hill, Margolies cast the deciding vote for President Clinton's controversial 1993 tax bill, a move that cemented her friendship with her future daughter-in-law's parents but likely cost her reelection in 1994. The Clintons, who have never forgotten the favor, returned it this year, campaigning for Margolies in her tight Pennsylvania congressional primary. Despite their efforts, Margolies lost to Brendan Boyle. Unlike the Clintons, who publicly pushed for a grandchild, the Mezvinskys never hounded Chelsea and Marc about grandchildren, the former first daughter told Rachel Ray in October 2013. "My husband has 10 brothers and sisters, so we have 18, almost 19, nieces and nephews, so there's not pressure from that side of the family," she said. "But from my parents, there is completely unapologetic pressure in private and in public." Marc Mezvinsky, a self-described "nerdy Jewish boy from Philly," generally shies away from the spotlight. He and Chelsea, who met at a political retreat as children, fell in love at Stanford, where Mezvinsky first served as "a shoulder to lean on" after Chelsea split with her long-time boyfriend, according to her chief of staff, Bari Lurie. Mezvinsky, who once dubbed the former first daughter "the yin to my yang," later married Chelsea in a lavish private ceremony in Rhinebeck, New York in 2010. When he spent several months at a ski lodge in Jackson Hole, Wyoming, in 2011, critics surmised the relationship had soured - but the couple insisted they were doing fine. President Clinton has even called Mezvinsky "a great human being." Now that he's produced that long hoped-for granddaughter, Marc has likely moved up in his in-laws' estimation.